The local Bald Eagle population has not been down by the Mississippi River for awhile, preferring the food opportunities available on land. 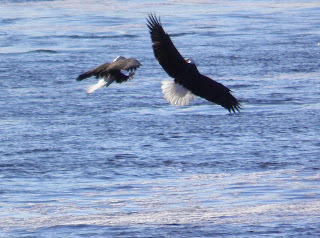 This week the migration of Bald Eagles from points north brought new arrivals. Dec 1st, 2pm, counted 20+ Bald Eagles visible from the viewing deck at Wings Over Alma, sitting in trees and fishing in the open water below Lock & Dam #4 on the Mississippi River. They are about 2 weeks early and it was an unexpected thrill to see them. Bald eagles will spend the winter at this location and we normally count 40 to 200 Bald Eagles a day between mid-December and the beginning of March. Dec 2nd, 2pm, counted 60 Bald Eagles on a bright sunny day. They were swooping and diving ... it made you wonder how they could pass each other without colliding. The juveniles were the most fun to watch flying into headwinds, low to the water, with a parent overhead guiding them on. Thousands of Ring-Billed Gulls migrating south had stopped over to fish in the open water but they were forced to feed around the lock & dam by the Bald Eagles. Dec 3rd, 10am, counted 102 Bald Eagles with 98 sitting in the trees and 4 flying over the open water. Most of the eagles stayed in the trees all day. The weather had changed to overcast with an expectation of snow later in the day. It was amazing to see 20 to 30 Bald Eagles in a single tree through the lense of a spotting scope. Since the Eagles weren't flying a lot today the Ring-Billed Gulls were everywhere. Lots of ducks and geese overhead in formation flying south. Almost 200 Common Goldeneye ducks rafting below Lock & Dam 4. Come experience this Bald Eagle explosion first hand at the Wings Over Alma Nature & Art Center on Main Street in Alma, Wisconsin or visit our website at http://www.wingsoveralma.org/ for more information.